The Eatwell Guide helps us eat a healthy, balanced diet with plenty of fruit, vegetables and starchy carbohydrates plus some dairy, meat, fish, pulses and other kinds of protein. Use the Eatwell Guide to help you stay at a healthy weight, which will lower your risk of getting ill. It also has important advice about staying hydrated. 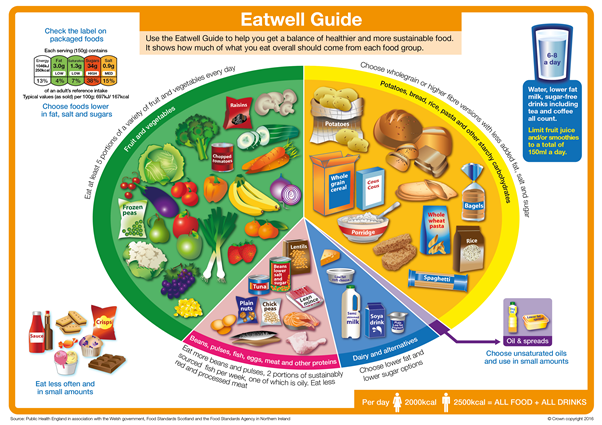 The Eatwell Guide now replaces the eatwell plate as the main tool showing you a healthy balanced diet. It no longer represents a ‘plate’ but still shows the proportions of the foods and drinks that make up a healthy diet. The proportions of food groups been updated to take into account the new dietary recommendations for more fibre and less sugar. Although some of the proportions of the plate have slightly changed, the general principle is still the same: eat plenty of fruit, vegetables and plain starchy carbohydrates (particularly wholegrains), some dairy, meat, fish, pulses and other sources of protein, and consume foods which are high in fat, salt and sugar less often and in smaller amounts.The Eatwell Guide also provides information on hydration, calorie guidelines and front of pack nutrition labeling. The development of the Eatwell Guide was led by Public Health England (PHE) in association with the Welsh Government, FSS and the Food Standards Agency in Northern Ireland. By the end of the tutorial, you’ll know what a healthy diet looks like, why it’s important, and what help is available to achieve it. There is also an optional assessment module and provided you pass you will receive a certificate.